Check out this lovely woodland stencil called Fox and Hare! This whimsical forest stencil is right on trend, as nature woodland themes are very popular in today's nursery decor. You can stencil the foxes and hares in one color using a dense foam roller for a simple monochromatic effect, or get crafty and paint each animal stencil in various colors using stencil brushes. Selecting a dark color background paint with make the whole design pop, as the animals will be stenciled in lighter paints on a dark wall. Unlike pricey woodland nursery wallpaper, our reusable animal stencil offers you an opportunity to choose your own color combinations and to perfectly match your decor. Stencil this magical forest design complete with cute foxes and hares in your kid's room or nursery! Bring the nature in, it's good for your little one :) Use stencils and save big on your nursery project! You can use this versatile stencil for wall painting, or try it for furniture stenciling. You can even stencil your own custom curtains with this trendy animal design! This stencil design is created by stencil designer Janna Makaeva and is exclusive to Cutting Edge Stencils. 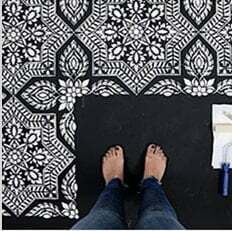 While it takes an experienced artist to create a stencil, stenciling itself is an easy painting technique that doesn’t require any artistic ability. As long as you can hold a brush or a roller, you’re pretty much good to stencil a wall! For stencil alignment instructions please refer to the step-by step photos above. Our large stencils are expertly designed by professional decorative artists, so stenciling a wall with Cutting Edge Stencils is easy and intuitive. Please make sure you watch our instructional stencil Video Tutorials! You'll find them extremely helpful for your stenciling project. Even beginners get great results!